Television continues to flourish as the first choice for video content consumption in India even as the adaption to digital platforms and alternate screens has registered a steady, rapid growth. The major digital transformation in terms of easy and cheap data availability, a rise in smartphone users and a certain change in the behaviour of video content consumer in India are no deterrent to the growth of television industry. TV still remains the first choice for the Indian masses, states an Economic Times report. Homes with TV sets in India have reached 197 million as against 183 million in 2016, states BI-2018, the latest Broadcast India survey by the Broadcast Audience Research Council India (BARC). The report will be released this week. With the steady 7.6% growth, total TV penetration in India is recorded at 66%, 2% higher than the last survey numbers. The 835 million Indians with access to television now exceed the total population of Europe. Smartphone penetration, in spite of a rapid growth over the past two years, in the country is still at around 300 million. The growth of television faces no immediate threat from alternate screens and mediums. “For at least 10 years, TV and appointment viewing will continue in India. The reason is that TV is extremely affordable. You can get a basic cable for ₹120 a month or free-to-air channels via FreeDish. The numbers definitely reflect strong growth in the TV universe,” Economic Times has quoted Jehil Thakkar, a partner at Deloitte India, as saying. “It is also important because TV, collaring 45% of the total ad spends, continues to be the largest medium for advertisers and is expected to grow at 13% this year. As per GroupM’s estimate, advertisers are expected to spend ₹31,596 crore on the medium, making it a vehicle of choice in terms of brand building. “TV is a preferred medium of choice to reach masses and advertisers’ behaviour is not going to change suddenly,” Thakkar added. 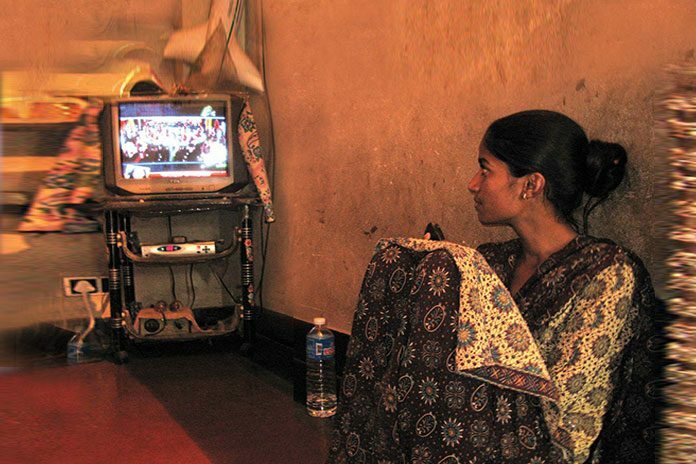 In India, 34% of households are still without a TV set. If easy availability of data has contributed to the growth of the digital content business, new villages coming on the “electricity map” of India are contributing to the growth of the television market. “The Narendra Modi government announced on May 1 that the country has achieved 100% electrification of 600,000 villages in the country. Most surveys suggest that once electricity reaches a household, the first electronic product it buys is a TV. “TV and refrigerator are two general use items people buy first once they get electricity,” Thakkar added. The five southern States – Andhra Pradesh, Telangana, Kerala, Karnataka, and Tamil Nadu – have more than 90% TV penetration. States like Uttar Pradesh, Bihar, Rajasthan and a few North East Indian States have a much lower number of TV sets, pulling down national TV penetration level to 66%. But, it also means that 34% of households in India are yet to buy a TV set.